Spring migration was a poor affair. Some of this could be attributed to the rather irratic coverage at certain times, but the whole period was still a considerable let down in terms of scarce birds. There were only a handful of wader records, thrush counts were low (even the almost traditional Fieldfare build-up failed to materialise) and when conditions were suitable, there was only a single record of two Common Terns. 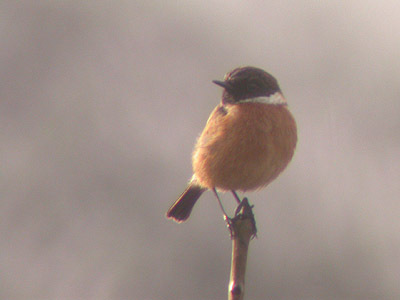 On the plus-side, Wheatears produced a good April total, there were two Redstarts, a trio of Stonechats earlier in the Spring and a single Whinchat. 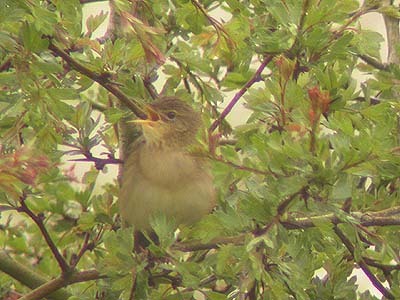 Both Garden Warblers and Lesser Whitethroats appeared in good numbers, resulting in an increase of the local breeding population. Grasshopper Warblers had their best year to date, with two males successful in attracting females and breeding at Eakring Flash. Other warblers appeared in smaller numbers than is usual most years. Whitethroats (whilst still being common) left suitable territories unnoccupied as some males failed to return. Returning migrants produced a varied series of arrival dates. Some arrived early, whilst others made very late appearences. Among those to arrive extremely early were House Martin (April 3rd) and Lesser Whitethroat (April 16th) with Hobby, Sand Martin, Redstart and Grasshopper Warbler all appearing a few days before their previous earliest dates. Both Blackcap and Willow Warbler were held up by bad weather over the continent and consequently produced their latest dates by quite a few days; though when they did arrive, it was generally in quite decent numbers per day. The only significant arrival of the Spring occurred on April 16th and 17th. Scarcer birds included nine Wheatears, a Redstart and Grasshopper Warbler - these coinciding with the arrival of commoner warblers. The weather was fine at the time, with a high-pressure system producing warm southerly winds. An indication as to the broad-scale of this arrival and how it probably affected most of Nottinghamshire and the Midlands, is that the four Wheatears present in the area on the 16th, were at three different sites. These included a female in a bare field near Church Hill, a male in similar situ between Eakring Meadows and Hare Hill Wood and a male and female in the horse paddocks (created in 2003) at the edge of Eakring village. Other birds of the day, included a male Yellow Wagtail (again in the horse paddocks) two singing male Lesser Whitethroats at Oil Bore Holes and Eakring Meadows, and a single Whitethroat. The male Redstart was a particularly excellent Spring sighting, with only two others here previously. It was interesting to note that there were also records of Redstarts at several other Nottinghamshire locations, not associated with breeding birds on the same day. The next morning saw a "reeling" male Grasshopper Warbler at the southern-end of Eakring Flash and a female Wheatear at Eakring Field Farm. Four Wheatears and a single Fieldfare were then found in the horse paddocks during the late afternoon. Again, there were more common warblers present at several sites, having arrived overnight. Overhead during the two days, there was a constant trickle of hirundines and Meadow Pipits. Most species produced relatively low total counts for the period. Perhaps the most notable were the following total counts:- 616 Meadow Pipit; 221 Swallow and 129 Sand Martin. In the past few months, I have expressed my concerns that the Cuckoo has been in decline during the current (2004) Spring period. To potentially support this theory, I looked back through my various notebooks to recover all of the area's Cuckoo records since 1998. I found that the number of males present in the area, had actually dropped steadily since 1999/2000 and that there had been just two male Cuckoos present each Spring since 2002. Correspondingly, the number of females has also dropped since a record three were present in 2001. This may be directly linked to the virtual eradication of the Sedge Warbler at one of the area's two (annually used) breeding sites, when tall, waterside vegetation was removed at Penny Pasture Common. This was effected by removing the wire fence surrounding the water to allow cattle access to graze and drink. Alongside Eakring Flash, this was the most regular site to see female Cuckoos and Sedge Warblers were very likely, the most frequent targeted host species. The first males have always arrived between the dates April 20-26th. Usually these birds stay until well into late May or early June, before disappearing. There have been just two Autumn records, both of which involved juvenile birds. 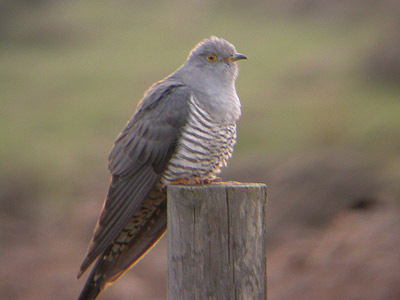 One aspect which led to the initial belief that there were far fewer Cuckoos during Spring 2004, was by the first arriving male's unusually short stay. It was also the latest-ever bird to arrive in the area to date, over the seven year study period. The period between first and second males arriving, was also much greater and gave rise to the initial speculation that there were indeed fewer calling males this year. This was also emphasized by a lack of Cuckoos at other (regular) sites I visited. Though people have heard Cuckoos at both these and other sites, most were during the first arrival period towards the end of April. It seems that a number of male Cuckoos have failed to stay for any length of time at many traditional sites (not just in Nottinghamshire) but across much of the UK. Listed below are the number of Cuckoos, recorded moving through the area during visible migration watches. Even the number of migrants moving through the area, has become non-existant over the past four years.